This article was written many years ago by Mrs Pratley, a former President of the National Angora Club. For present day Angora keepers, some things have changed. Wool is stored in self seal heavy duty freezer bags rather than newspaper, tins and boxes, and the rabbit is often clipped sitting on the owner’s knee. Plucking is rarely performed nowadays, as to pluck ethically and correctly is extremely time consuming, as it is done over several weeks whilst the rabbit is moulting. Lakeland Mothstop is the product recommended now to protect wool from moths. Waste wool can be composted, or left out for the birds in Spring for nests. 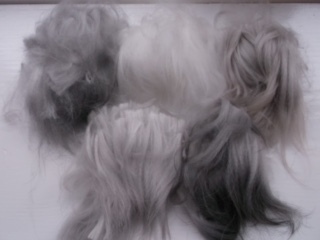 When and how often to harvest Angora wool is the first problem encountered by the beginner. Usually the best time to clip is as soon as the wool is about 3” in length on the back. For plucking it should be a little over this length. 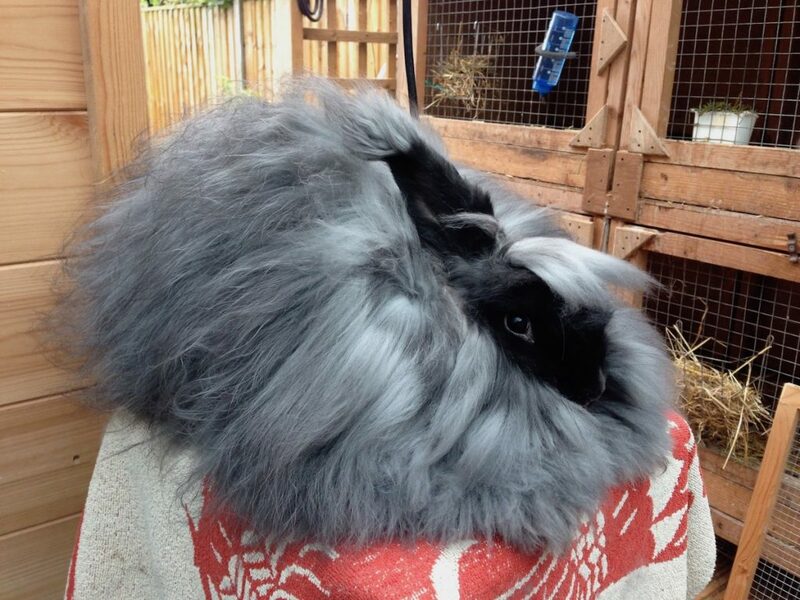 For about nine and a half months of the year the Angora can be stripped of its coat without fear of discomfort from weather conditions, whether housed indoors or out. 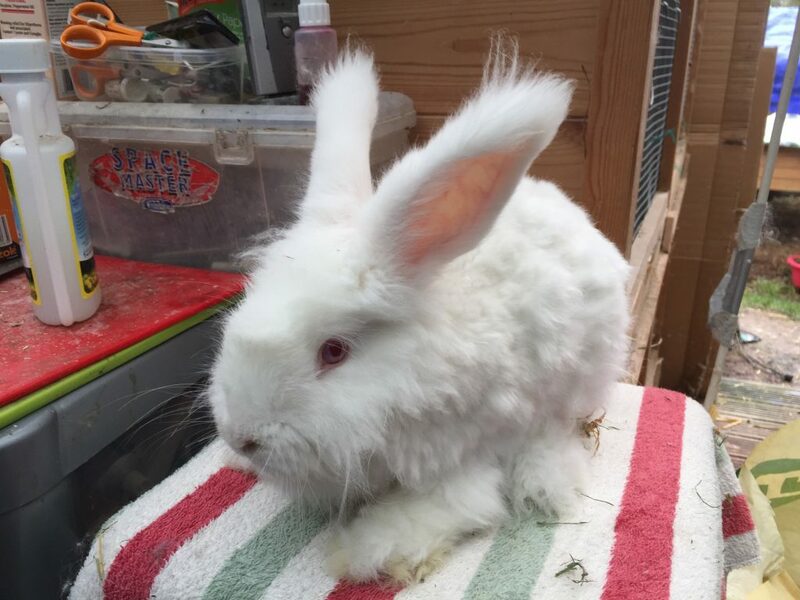 While I have never known an Angora catch cold after clipping, it is only natural that an animal lover will think twice before denuding a rabbit in severe weather. A study of temperatures expected for a few days ahead is the best guide during the two most severe months of the year, January and February. If there is no prospect of frost for about a week ahead, then go ahead and clip, housed indoors. If the stock is out of doors, it is really best to arrange wool harvesting so that the last clipping comes in early December, and is not due again until the beginning of March. With rabbits that tend to mat before the 3” length is reached, clip earlier, say at 2” to 2½“. The wool harvested is “seconds”, and will not fetch as high a price, and again, the quantity will be less, but harvestings at this length are more frequent, five or six per year compared with four at the customary length, and the proportion of good free wool will be higher at this shorter length with a troublesome rabbit. Have the necessary equipment ready at hand before commencing harvesting. This will consist of a grooming stool with a top not more than 12” square, covered in towelling or hessian to give the rabbit firm foothold and sense of security, grooming brush, clipping scissors (the long-bladed type with very sharp points as used by hairdressers), boxes or tins for the wool, and a supply of newspaper. First, groom the rabbit and decide from the state of the coat whether the wool is to be clipped or plucked. For plucking, the rabbit must be in a state of moult that allows the wool to leave the skin without effort at the slightest pull. This method is preferable if the wool is to be used for handspinning and certainly recommended for coloured Angoras if a coat of very light colour is to be avoided at the next harvesting. Grip a small lock of wool between the finger and thumb and pull gently. If the wool comes away easily without disturbing the rabbit, continue. If not, it will be painful for the rabbit and plucking must be postponed until the wool is really ripe. It is very seldom that a rabbit can be plucked entirely at one sitting, except in the case of one in full show coat of considerable length, as the moult gradually spreads over the body, starting from the front, and usually the coat has to be harvested by degrees at weekly intervals over about three weeks. Assuming the wool is ready for plucking, take off as much as possible, lock by lock, placing it in a sheet of newspaper, which will prevent crushing in the eventual packing. For handspinning, it is advisable to keep the wool from each rabbit separate. Well-matched garments can only come from well-matched wool, and it is surprising how the texture and shade of the wool from the same rabbit can differ from each harvesting, let alone with various rabbits. It will mean accumulating a collection of these small newspaper packages, but it is well worth the inconvenience. Once a rabbit’s coat has been entirely plucked, fold the ends of the newspaper, and store in tins or boxes until required, first having sprayed the inside of the container and all round the closed lid outside with a liquid moth –deterrent. Cooper’s Mothproofer is greatly recommended. For commercial use, and certainly the commercial producer, clipping is by far the speedier method of harvesting. It can be completed at one sitting, and though the beginner is likely to make it a lengthy operation at first, an expert can strip a rabbit in a few minutes. 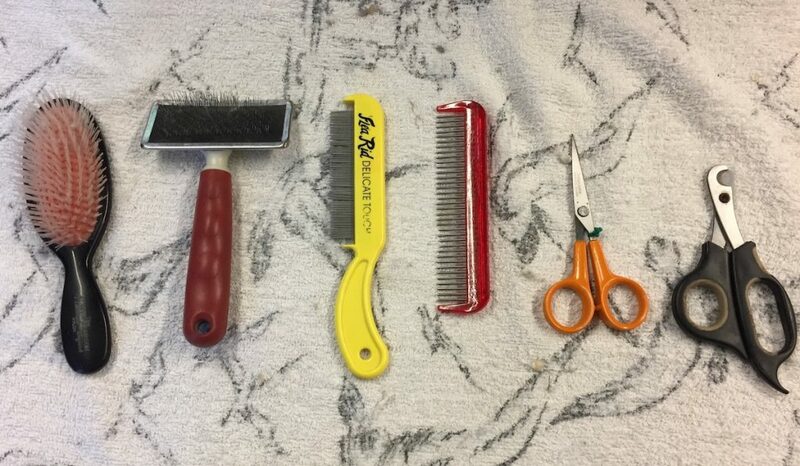 For clipping, three tins or boxes will be needed for wool, one each for the first grade (2½“ to 3”), second grade (2” to 2½“) and for shorter but free wool, the wool being graded as it leaves the rabbit. 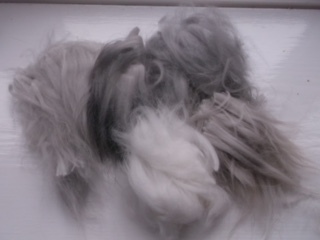 After grooming, make a rough parting in the wool along the centre back. Slide the points of the scissors under the wool to a depth of ¼“, with the blades as close to the skin as possible to ensure an even clip. 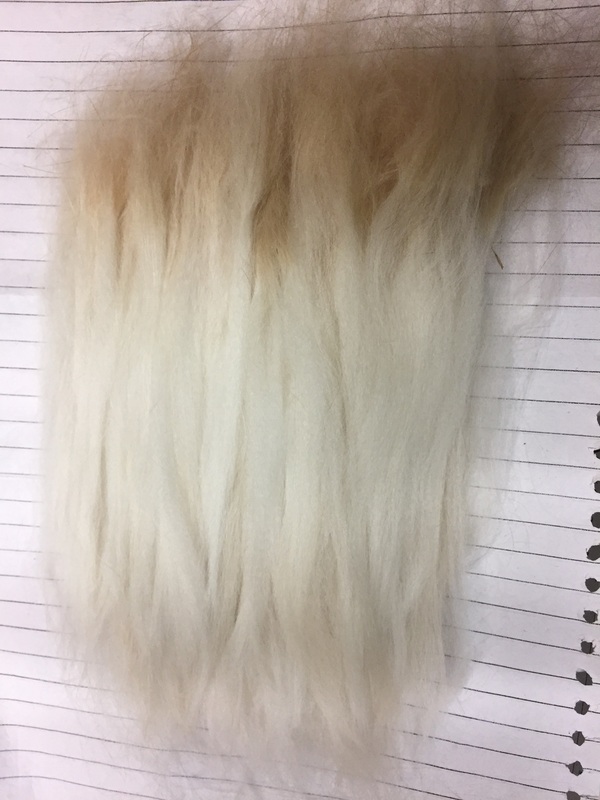 Take about 3” locks of this depth, giving each a slight flick with the scissors after cutting so that it stands clear of the skin, and can easily be removed without disturbing the strands of wool. Arrange in layers, as clipped, on a newspaper, all ends parallel with the tips facing one way, keeping the grades separate. In deciding the length, the tip should be excluded. Generally speaking, if the back is of first grade, all except the wool under the chin and on the lower flanks will be about the same length. Be careful not to take the locks deeper than ¼“, or, as the contours of the rabbit’s body are followed the scissors will clip further away from the skin, and if those resulting tufts of stubble are accidentally re-clipped with as subsequent lock (double-clipping, as it is termed), it will lower the grading of the wool unless carefully removed before packing. Matted and webbed wool should be discarded. It is very seldom saleable, and only then at a very low price that hardly justifies the postage and packing unless in substantial quantities. Lying around, it can only provide a breeding ground for moths, and most breeders advise burning it these days. If the rabbit is a doe that is to be bred from in the near future, leave all the wool in front of the shoulders and under the chin, as she will need this for the nest making. Bucks can be stripped entirely. To clip the wool under the chin, hold the rabbit’s head in the left hand, fingers under the chin, raise slightly, and clip the wool in layers as quickly as possible, as the rabbit’s patience is soon exhausted in this position. Grading of this area can be left until it is off. The wool on the tummy has little value as it is rather shorter and of coarser texture, and is, therefore, seldom worth harvesting, though removal is necessary if matting has occurred. To do this, sit on a low stool, turn the rabbit over on its back so that it lies comfortably in your lap, and grip its ears gently between your knees. Exhibition rabbits will be thoroughly used to this position for grooming, but others can be very rebellious and the assistance of a second person may be needed if injury is to be avoided. It is not necessary to remove head or ear furnishings unless matted. Feet furnishings are a nuisance once show days are over, and are best removed at each clipping, though the wool will have no value. Take the wool off the tail, particularly if the rabbit is a doe that is to be mated. Once clipping is over, or plucking, as the case may be, give the rabbit a teaspoonful of liquid medicinal paraffin. He usually washes himself thoroughly after stripping, and may take in loose strands of wool. The paraffin ensures he will not become wool bound, a condition that is also likely to develop if the rabbit is kept too long in a moulty coat. As with the plucked wool, pack the graded clipped wool in the newspaper packets into the respective tins or boxes. For commercial use there is no need to keep each rabbit’s coat separately, so all wool of one length can go into one parcel. Again do not forget the anti-moth spray both summer and winter. When sufficient wool has been collected to warrant sending to the Mills, say from 8 oz. upward, pack the parcelled wool into one large container that will stand up to ill-treatment in the post, and enclose your name and address as sender. It is best to leave weighing to the purchaser. The Mills are very honest, and few breeders have scales of sufficient accuracy to weigh to fine limits. The Mills may also re-grade. The inclusion of tiny pieces of hay, a few webby or stained locks, or wool that has felted owing to being packed under pressure, will reduce the value of an otherwise well-graded package, so a little care is worthwhile. With regard to the sale of plucked wool, the market is not a ready one, and has to be individually sought among hand-spinners. Once you have a buyer, ascertain her precise requirements regarding packing and harvesting. Since the price is rather higher, the requirements of the spinner are worth studying. A high fibre diet with plenty of hay helps prevent wool binding, otherwise known as wool block. 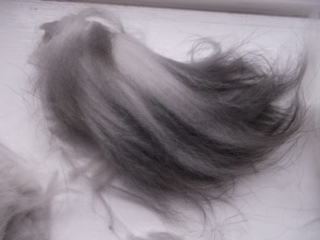 Many modern breeders give a small amount of a feline hairball remedy after clipping rather than liquid paraffin. There is no longer a commercial market for wool and sadly the references to the Mills are now only of historical interest. However matted and webbed wool is of no use to the handspinner, who also prefers no vegetation or double clip. Posted 09/08/2018 by LH & filed under Angora Welfare, Wool Products.